SAN FRANCISCO, Calif. — On Saturday, March 14, 2009, over 500 middle and high school students from Northern California schools will convene at San Francisco State University to compete in the largest annual academic event for San Francisco area students. Over 1,000 middle and high school students, volunteer judges, educational leaders, and community guests are expected to take part in the seventh annual World Affairs Challenge(TM) hosted by San Francisco-based global education non-profit World Savvy. 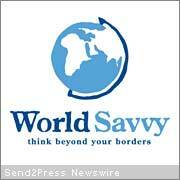 For more information, visit http://www.worldsavvy.org. World Savvy is a global education nonprofit with the mission to educate and engage youth in community and world affairs, to prepare them to learn, work and live as responsible global citizens in the 21st century. Serving youth ages 10-18 and educators, World Savvy offers three core programs – Global Youth Media and Arts Program (MAP), World Affairs Challenge(TM) (WAC), and Global Educators Program (GEP). Additionally, the Global Affairs Monitor (GAM), an online, subscription-based current events service, provides an in-depth report on an issue or region of global importance. Since its inception in 2002, World Savvy has grown from serving 25 teachers and 100 youth to serving more than 750 teachers and 5,400 youth in 2008-09, with offices in San Francisco, Minneapolis-St. Paul, and New York.